Don’t forget! Only two days left to enter this week’s giveaways: Artisana Nut Butter Gift Pack and an OXO Handheld Mandoline! Be sure to follow the links and enter! Last week, M. and I visited The Farm Institute in Katama, where we met with Julie Olson, the Farm Manager and best tour guide on the farm to show us around and introduce us to some soon to be delicious animals. We met Ruth (soon to be delicious steaks), Carey (soon to be delicious bacon), Snowflake (soon to be delicious lamb chops), and about a million chickens (soon to be…delicious chicken!) 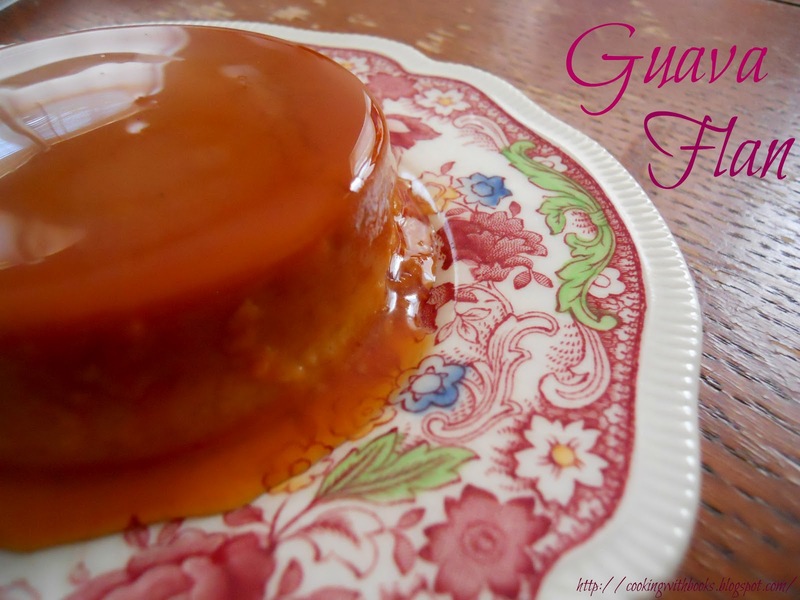 And delicious chickens lay eggs, which become delicious Guava Flan. (Have I said delicious enough times to make you mad? I’m sorry.) 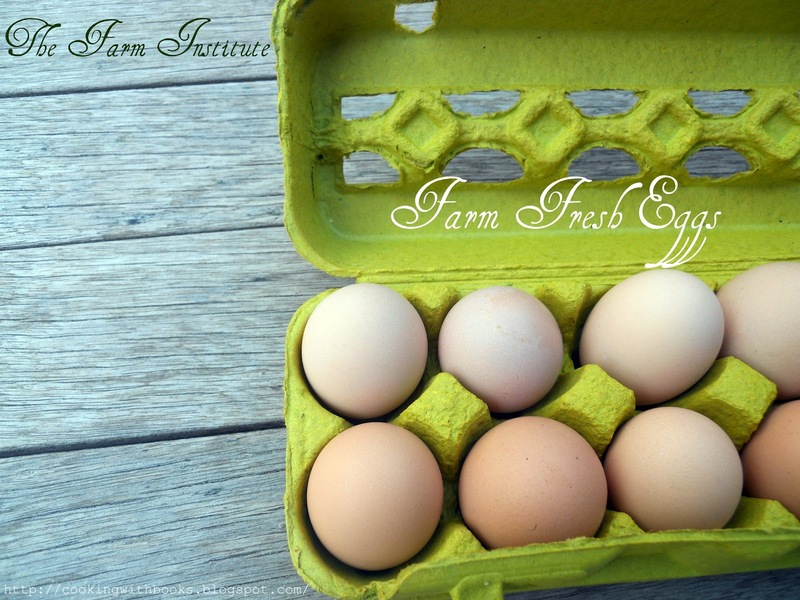 Farm fresh eggs, cage free and their moms were left to roam happily all over the farm. Eggs that had yolks as bright as orange zest! Read more about my visit to The Farm Institute over at Martha’s Vineyard Online. Have you ever had Guavas? Hopefully you have and if you haven’t please scout them out! There are a few varieties of guavas, but I grew up with a guava tree in my backyard that harvested the sweetest guavas ever, with a rosy pink interior. We’d also purchase guavas of other varieties, with a stark white interior and crunchy texture. In this recipe I used guava paste, a dark purple product made with guava and sugar. It’s sticky and melts easily do to the high amount of sugar in it, thus this is the only sugar (other than the caramel), in this recipe. Preheat oven to 325F. Place four small ramekins in a baking dish. Set aside. In a small saucepan, stir sugar and water together and cook over high heat until sugar turns a light golden brown. Pour caramel into ramekins and coat the bottoms. In a medium bowl, whisk together the milk, cream, eggs, melted guava paste, vanilla, and salt. Strain and pour into ramekins. Add hot water to the baking dish (bain marie) and place in oven for 35-40 minutes, until flan sets. Chill overnight and to unmold place halfway in hot water. Slide a thin knife around and flip over on serving plate. Enjoy! The flan sounds great. I used to live in Miami where so many of the bakeries made delicious pastries with guava. This looks delicious and a perfect portion just for me I don’t like sharing desserts!!! This looks scrumptious! I have to make some soon! Thanks for the recipe Nella :)Have a fabulous weekend. Seems delicious and good idea with guava. ahahaha you got it girl! ‘soon to be…’ In any event this flan reminds me of my days growing up. Never had guava in it but another fruit favorite from back when along with mango and what people consider exotic!